Bijou (meaning jewel in French) has been in our family since we lived in Texas, and has been an important member of our family of six. Whether she’s eating ham from my son’s sandwich, or looking at us expectantly when we open cans of tuna, one thing’s for sure; our home would never be the same without our little lady, our Bijou. Since then, she’s put up with a lot of things, from coyotes hoping to make their meal of her, to a family with four young kids, 12 and under. Regardless the challenge, she’s always been there with us. An avid hunter, she was welcomed by neighbors, and helped keep voles and mice at bay in our small corner of the neighborhood. When we moved to Colorado, our Texas neighbors were saddened, but Bijou quickly made herself at home in the older Boulder home with even more mice to dispatch. Now she spends her time hunting, taking long walks along the fence line, and loudly reprimanding the neighbors who don’t pet her immediately. It’s her job after all. For a non-Siamese, our girl is pretty verbal, letting us know in articulate yowls and miaouuuuus and chirps and squeaks what she thinks of things. Some cats give you the eye, but there’s none of that with Bijou, who’s not afraid to bristle her tail and chatter at us for permission to eat. Sometimes she loudly scolds us when we haven’t let her in (or out) with enough expediency. And she always patiently inwardly sighs when one of the kids thinks it is hilarious to stage ridiculous cat moments on film. She also tends to stretch herself out strategically under the cherry trees. Appearing as though she could not care less what happened around her, she licked her paws and elongates herself in a long, feline yawn, one eye squinting around for robins who had been happily chattering about those red, ripe bits of fruit. Strangely, no cherries disappeared, but a few less robins have been seen chattering. And, as always, Bijou remains happy with herself. One day it arrived from the deep. 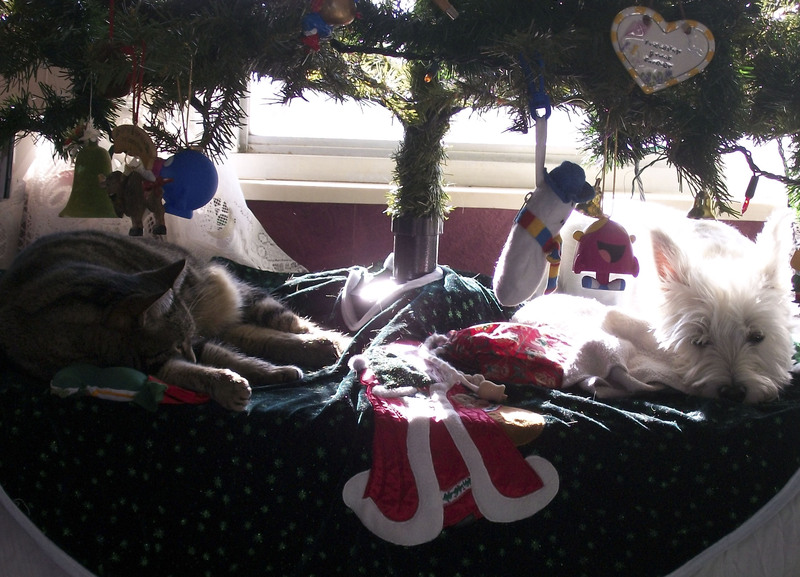 All right, maybe that’s a little dramatic, but when Aspen, our white Westie, came home with us a few years later, Bijou was so annoyed with us for shaking up her comfortable, quiet home that she soundly refused to enter the main level of the home for weeks. I can’t say I blamed the girl. The dog, after all, proved to have no manners, and Bijou has always been a lady through and through. As a matter of fact, see the top, featured image? Bijou rests, savage huntress of the Savannah… but wait; that’s no wild scene. The rest is below. Still, after years of careful training, the sometimes-impolite-in-her-exuberance white creature with the big doe eyes and a nose that looks like a black olive has finally passed Bijou’s muster, and is allowed to preside in her presence. In fact, while I wouldn’t go so far as saying the two are fast friends (more along the lines of slow acquaintances with boundaries enforced by cat claws) the two are amiable, Bijou showing, as she always has, the way to her little furry heart is in not eating her food and drinking all of her water when she’s not looking or stealing her warm spot on the sofa when she’s popped out to investigate a ham sandwich. Bijou tolerates Aspen now, even if ever so slightly. And, as with the rest of us, Aspen wants to be near her friend and mentor, the true alpha dog of the family: the cat. How do you feel about your sweet, sometimes finicky bundle of love? Purina wants to know– and you might win $5,000 in the process. Pick a theme, create a title and tell us your story. * Share any story you’d like, but be sure to tell us how very special your relationship is with your cat as well as how he or she is always there for you—these are important details that will help us select our finalists. And although photos and videos are optional, we’d certainly love to see you with the cats in your life! Stories shared between 12:00:01 p.m. ET June 4, 2012 and 11:59 a.m. ET July 31, 2012 are entered into the contest. And you can share your story through Facebook, YouTube or CatChow.com! • Vote for the winners—one of them could be you! Our finalists will be announced and voting begins on Facebook, YouTube and CatChow.com August 28, 2012 at 12:00:01 p.m. ET. Votes will be accepted through 11:59:59 a.m. ET on September 18, 2012 and the winners announced on or around October 1, 2012! There is a limit of one vote per person/IP address, per day, from all voting channels combined. And 40 honorable mentions win a $100 Amazon gift card! For complete details, see Official Rules.